Diagrams and data for the frieze groups are presented. The diagrams show the symmetry elements and the general position. The data include: the origin; the asymmetric unit; the symmetry operations; the generators selected; the positions, with multiplicities, site symmetries, coordinates and reflection conditions; the symmetry of special projections; the maximal non-isotypic subgroups; the maximal isotypic subgroups of lowest index; and the minimal non-isotypic supergroups. 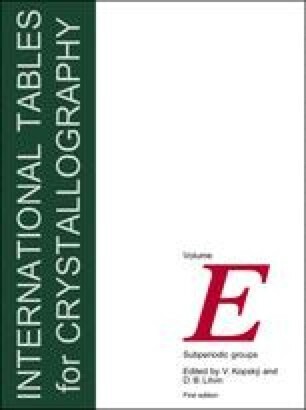 This chapter is also available as HTML from the International Tables Online site hosted by the IUCr.